Research in the lab is dedicated to expanding our work in modulation of DNA repair. We are interested in mechanisms whereby alternative forms of homologous recombination can lead to large-scale genomic alteration. These processes are of particular importance in relation to the development of secondary malignancies after cancer treatment. Determining factors that influence these pathways may additionally enable efficient genetic manipulation of mammalian cells and thereby facilitate reversal or prevention of disease. Click for more detailed information. We additionally maintain a website of our most commonly used molecular biology protocols. 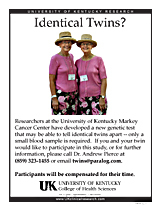 We've developed a new genetic test for genomic instability so we're now recruiting human subjects, particularly families and/or identical twins. 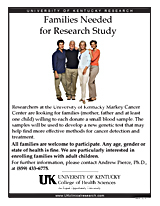 We are collaborating with Dr. Susanne Arnold (lung cancer), Dr. David Vargas and Dr. Jon Hourigan (colorectal cancer), Dr. Jeffrey Moscow (pediatric leukemia), Dr. Dianna Howard (adult leukemia) and Dr. Heather Pierce (studies on healthy humans) to look at chromosomal instability in cancer patients but we're also looking for healthy people to serve as normal controls. We don't want your money, just one or two teaspoons of your blood... (sorry UK College of Medicine students, the bioethics people won't let us experiment on you). I hold the position of Assistant Professor in the College of Medicine at the University of Kentucky, with a primary appointment to the Markey Cancer Center and academic affiliation to the Department of Microbiology, Immunology and Molecular Genetics and the Graduate Center for Toxicology. I serve on the editorial boards of BMC Molecular Biology and the American Journal of Translational Research. You can download reprints of my published papers and see more details of my profile from my professional links page. Lectures I've given at UK are also available on the web. I am the course director for the second year graduate course MI615 - Illustrated Topics in Advanced Molecular Genetics. Dawn is a graduate student affiliated with the Graduate Center for Toxicology. Dawn is using physical analysis to study chromosomal architecture and alterations induced by genotoxic stress. In addition to completing her Ph.D, Dawn was awarded a Masters degree in Clinical and Translational Science. She is now pursuing post-doctoral studies at Vanderbilt University. Michael Killen Michael is a graduate student through the Micro Department. He is studying chromosomal sub-structure in real-world people and genetic components of underlying genomic stability. Taylor Erica and Tiffany are currently doing undergraduate research projects in the lab. Pam Thompson Pam was our senior research technician for two years. She is now doing clinical cytogenetics for the hospital. Abby did her fourth-year undergraduate research project with us. She initiated using RNA-interference to knock down expression of interesting genes. Alex Wilson Alex was a summer outreach student for two months. His project in that time was to clone a gene, with suitable site-directed mutagenesis, from a bacterial genome into a mammalian expression vector. Success! Alex is currently continuing his studies at Transylvania University here in Lexington. Other undergrads that got some hands-on research experience: Sara Wheeler, Mathew Ruwaya and Andrea Asher.